Blood pressure in the small capillaries at one end of the nephron (called the glomerulus) pushes fluid into a sack called Bowman’s capsule. Red blood cells and larger proteins are too large to pass from the glomerulus into Bowman’s capsule, but water, ions, and amino acids, are small enough to pass through. This mixture of water, ions, amino acids, and other small molecules is called the filtrate. This filtrate is further modified as it travels through the rest of the nephron. The filtrate travels from Bowman’s capsule into the proximal convoluted tubule. The goal of this step is to reabsorb (in other words, not excrete) important nutrients including amino acids, glucose and vitamins that are still present in the filtrate. These are transported out of the nephron into the interstitial space and are reabsorbed by capillaries that run next to the proximal convoluted tubule. In addition to saving important nutrients by transporting them out of the filtrate (reabsorption), waste products including , ammonia and urea are transported into the filtrate for excretion. The descending limb is only permeable to water. As the Loop of Henle descends from the cortex into the medulla, concentration of salts in the interstitium increases (you will learn why that happens in the next step). As a result, the medulla is hypertonic to the filtrate, so water will diffuse out of the filtrate on the descending part of the loop, and urine concentration will increase. The ascending limb is only permeable to salts, not water. In the ascending limb, salts (, etc) leave the filtrate using both passive and active diffusion. This is what causes the renal medulla to have a high salt concentration and therefore be hypertonic to the filtrate. The filtrate dilutes on the way up the ascending limb. At the top of the ascending limb, is a thick section called the diluting segment. This section is thick because it contains many mitochondria required to actively pump out salt from the hypotonic filtrate to the more hypertonic blood! You can distinguish this from the proximal convoluted tubule, which is closer to Bowman’s Capsule, because distal means further away (think distance). 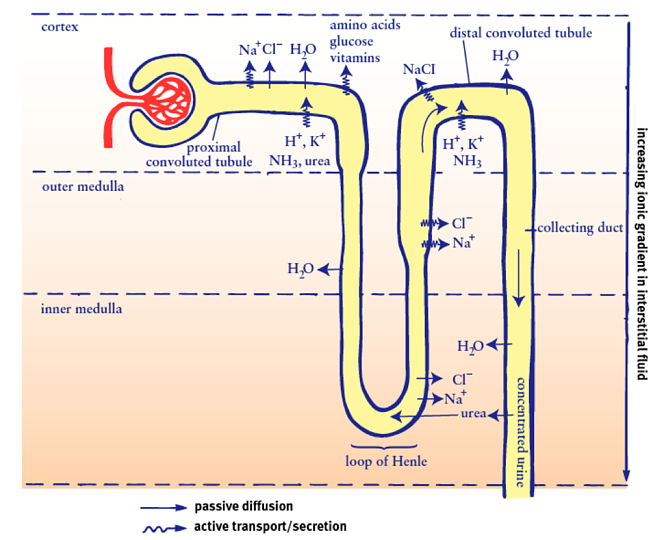 Functionally it does many of the same things as the proximal convoluted tubule; waste products ammonia and urea are transported into the filtrate for excretion, while calcium and sodium continue to be reabsorbed (via active transport out of the nephron into the interstitium). Because water generally follows salt (through osmosis), water also leaves the nephron, which further dilutes the filtrate. At the end of the distal convoluted tubule, the filtrate empties into collecting ducts, where it combines with filtrate from other nephrons. Collecting ducts move back into the medulla, which is salty, so more water leaves through passive diffusion. The collecting duct is important because it has variable permeability that is controlled in part by the hormones aldosterone (which increases permeability of the duct to water by opening aquaporins) and antidiuretic hormone (which increases Na/K pump activity), both of which result in more concentrated filtrate. You may have a noticed an organizing principle during this review; in general the horizontal portions of the nephron function to keep what the body needs and eliminate what it does not need, while the vertical portions of the nephron function to control the quantity and concentration of the filtrate, mostly by controlling the movement of water in and out of the filtrate. Good luck as you work to master this important content! Are you interested in connecting with Eden, or one of our other New York or Cambridge biology tutors? Craving more tips and tricks on biology from our blog?